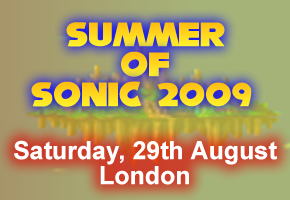 Summer of Sonic 2009 gets Dated! That’s right! The world’s most successful Sonic convention is back! Last year The Sonic Stadium and SEGA Europe hosted (with help from Sonic Wrecks) the largest Sonic convention that the world had ever seen! The event saw people come from all of the world to a hall in Covent Garden, London to celebrate their love for SEGA’s mascot. The event had a playable demo of Sonic Chronicles, the Guinness Book of Records taking an official speed run down, a special song from Dreams of an Absolution singer Lee Brotherton, signings from Sonic the Comic’s Nigel Kitching and a performance from TJ Davis and Richard Jacques. What started out as a fleeting idea from the Stadiums head man Dreadknux, turned into sensational event that had the whole internet talking! If you missed it last year, then they are giving you another chance with a bigger and better event! The date is Saturday, 29th of August. The place once again is London. However, the venue is yet to be confirmed. So what we’re doing here is getting a sample of interested people so we (that’s the Summer of Sonic organisation staff – consisting of myself and AAUK of SEGA Europe for now) can get an idea of how big a hall we can squeeze out of our budget. All you need to do is post a comment stating how many in your household are able to come to this event on the 29th August. …here’s some information that will whet your appetite – Jun Senoue knows of Summer of Sonic. Richard Jacques said he would happily attend another SoS. You couldn’t stop Lee Brotherton from getting involved again. Sonic Team’s reaction to SoS 2008 was also reported to be very positive, and SEGA Europe as a whole are both very keen to be more involved yet very respectful as to this being about a fan gathering rather than a buck generator. This post has already got excitment from within the community racing with an abundance of comments being left on the article already. Remember, if you plan on attending then please leave a comment yourself to help aid the organisation of this great event! GET OVER THERE NOW AND MAKE YOURSELF KNOWN!